When you’re planning for your next hike, sandals are probably not the first type of footwear that comes to mind. But did you know that some types of sandals are built just for hiking? They’re particularly great for warm weather and tropical climates. No one wants to be caught wearing bulky shoes in a Balinese rainstorm. Furthermore, they’re also a great option for a multi-day hiking or backpacking trip. So, what are the best hiking sandals? We’ll show you. We love making your life as easy as possible when it comes to traveling. In this article, we’ll walk you through some of our picks for the best hiking sandals for men and women. And because fashion matters to, we’ll try to keep them as stylish as possible. When it comes to finding the best hiking sandals, there are a few things you should consider before you make your purchase. No, a simple pair of flip flops are not going to cut it. Besides offering breathability, the best hiking sandals are water resistant, provide heel and ankle support, and are wonderfully lightweight. Footwear is one of the most important pieces of gear to get right before you hike. Choosing the wrong shoes will not only leave you unprotected but ridiculously uncomfortable. No one wants wet, cold feet and blisters. Hiking sandals are a great option for those who prefer feeling a little more free. Plus, if your feet ever get cold, you can always slip on some hiking socks too. There are so many travel items and accessories on the market today. We understand how easy it is for indecision to strike when trying to choose the best hiking sandals for travelers. That's why we want to help ease the process. Do You Need Water Resistant Sandals? Are There Any Special Fit Needs You Should Take Into Consideration? Keep in mind that different companies will offer different types of fits. The best hiking sandals will fit well (not too loose or too tight) and offer extra measures for comfortability. 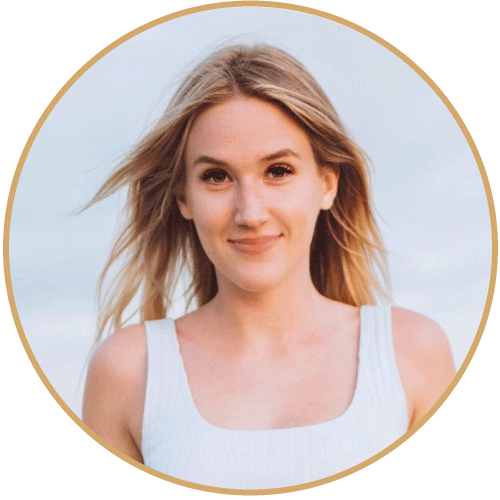 You are probably already familiar with the features you need. If your feet are on the wider side, Teva and KEEN are good brands for you. For those whose fight tend to be on the more narrow side, ECCOs and Chacos tend to run smaller. Hiking sandals have become very popular in the last ten years as experienced hikers gravitate towards ultralight backpacking. Even those who prefer hiking boots understand the benefit of having an extra pair of shoes at a campsite. Hiking sandals are not recommended for super rough terrain but they are perfect for mild and easy routes. They’re great for wearing around a campsite and since they’re ventilated, they’ll dry after you cross some streams in the backcountry. Am I Trying to Pack Light? For ultralight backpacking, sandals are a great pick. Just keep in mind that you don’t want to pack heavy and wear light shoes. That would put an unnecessary amount of stress on your joints. Do you have high arches in your feet? Unlike regular sandals, the best hiking sandals are equipped with great padding and arch support that enables hikers to explore their trails comfortably. A footbed that matches the shape of your foot will also add extra comfort. Will I Need Shock Resistance? 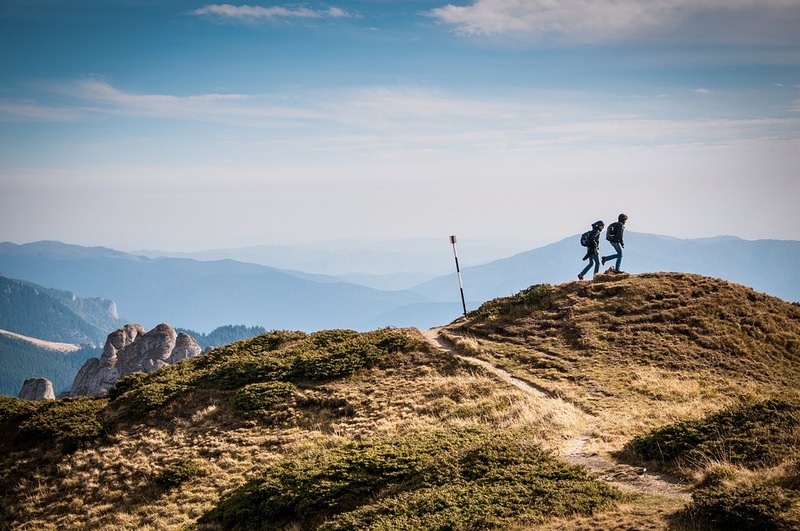 If you’re investing in a good pair of hiking shoes, consider finding a pair that is shock resistant. Sandals with ethylene vinyl acetate (EVA) and foam insoles absorb shock very well. Make sure you get the right fit for your sandals before your hike. We highly recommend breaking them in on a day trip or wearing them for a day or two before the big adventure. Adjustable straps are a lifesaver. Not only are they great for fitting sandals properly but they also provide relief when your feet are swollen from the elevation. When it gets a bit chillier, just slip on a pair of Smartwool socks underneath them. If you plan on doing moderate to more difficult hiking, it’s important that your sandals have protection for your toes. Exposed toes can be injured by rocks, roots, and other debris. 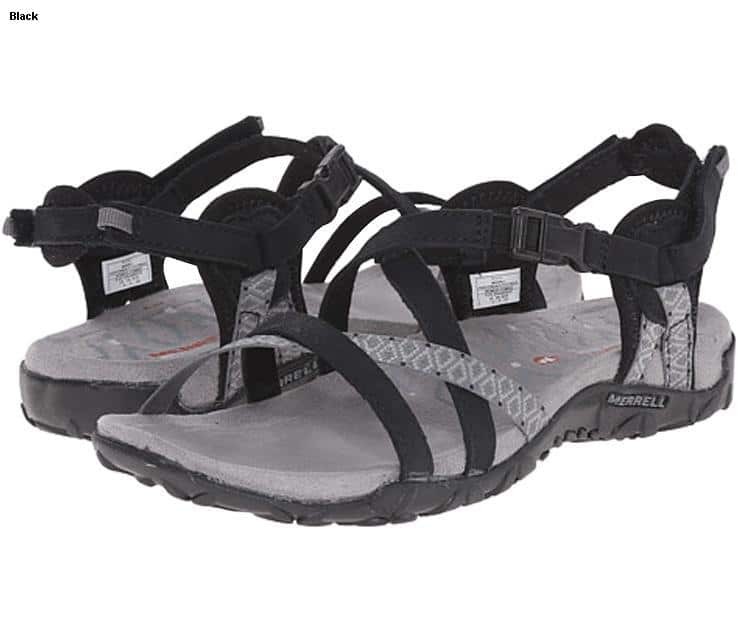 However, if you don’t plan on doing serious hiking, Teva is one of our all-time favorite brands. Thanks to a solid grip lightweight tread, these hiking sandals work well even on slick or uneven terrain. You don’t need to worry about getting cold wet feet walking through water either. The body of the shoes are water resistant and designed to dry very quickly. 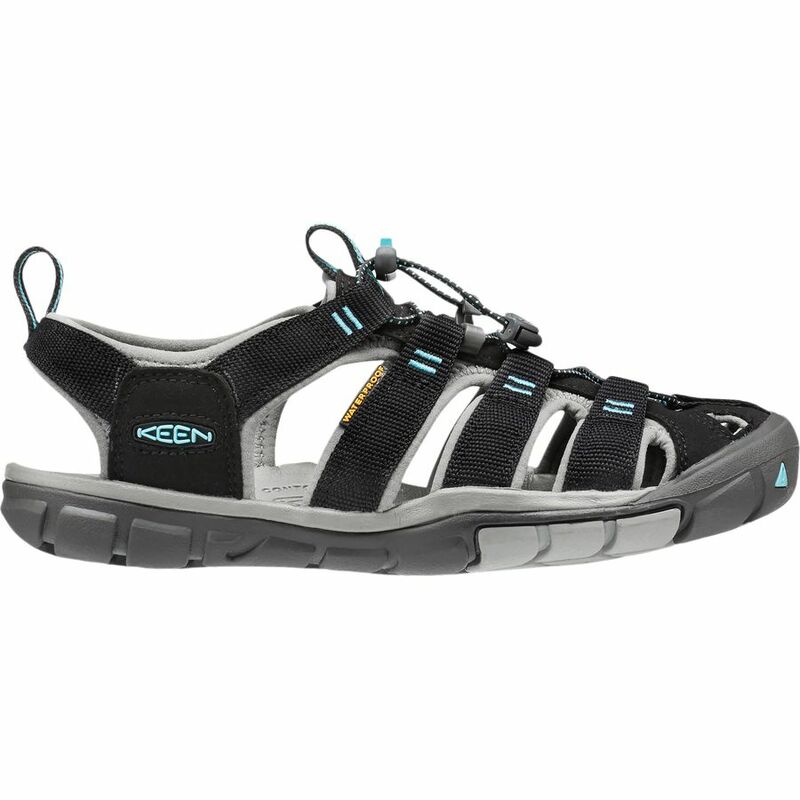 KEEN sandals are widely recognized for having the best arch support on the market. Keep in mind that the sizing can vary from style to style. The women’s Clearwater CNX comes in five different color options while the men’s Clearwater CNX offers seven color options. 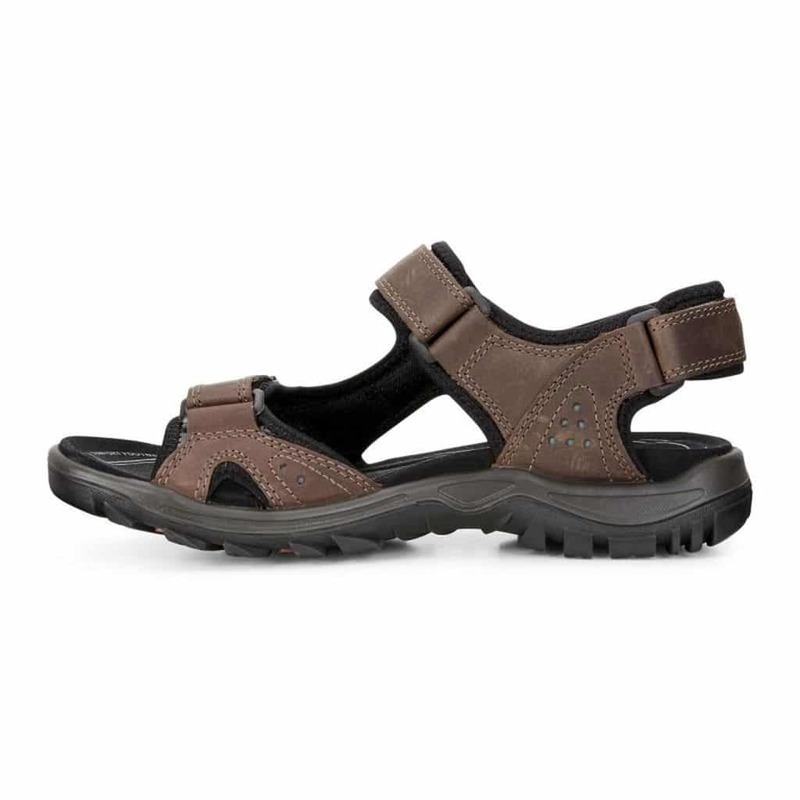 Slip into the Merrell Terran Lattice II, a soft strap adjustable hiking sandal. There are nine colors available ranging from a classic black to the more flash teal and lime. While these sandals are designed for hiking, they’re cute enough to wear around town without giving it a second thought. While style is great, practicality matters more. Lucky for you, these sandals offer extra cushioning in the heel and full arch support. Looking for the best hiking sandals? Enter the amphibious Teva Original Universal. Not only are these shoes stylish but they are super comfortable too. The sole adds a cushioned step without absorbing water or adding extra weight. Furthermore, Teva’s clever adjustable strap system allows for a more secure fit. Now, you’ll never have to worry about trekking around with an annoying loose fit again. Keep in mind that Tevas are best-suited to those with wider feet. 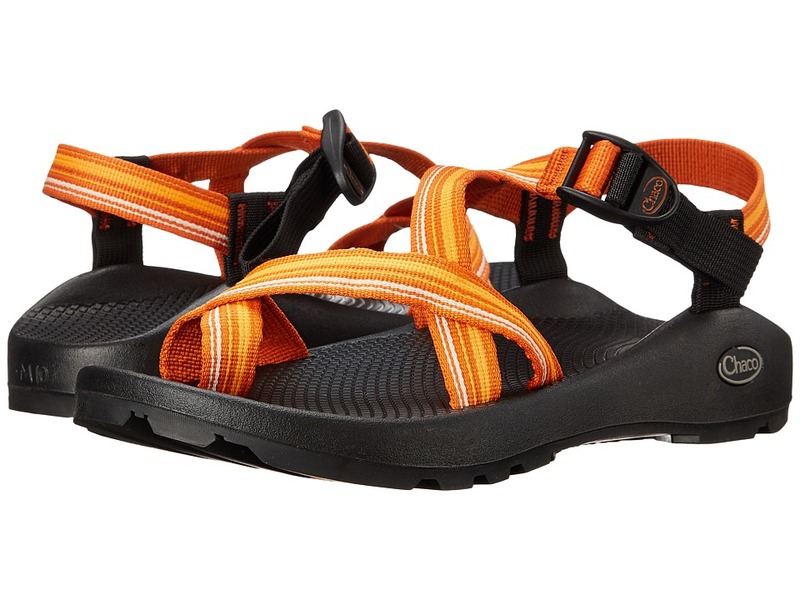 If you’re looking for the best hiking sandals for men, you won’t find better than the Teva Omnium Closed-Toe. Openings along the top and sides of the shoe allow for optimal air flow, while the thick heel strap provides more ankle support than many other types of hiking sandals. When it comes to finding your perfect fit, Teva offers this style in both regular and wide. We absolutely love the Men’s Z/2 Unaweep. If you’re looking for the best hiking shoes for men, you found them. The solid base is water resistant, so your shoes will stay lightweight and dry quickly. Non-slip soles give you all the traction you need to climb across slippery rocks and up moss-covered trails. If this is your first pair of Chacos, we highly recommend getting a professional fitting. The brand tends to make products that run different than a regular shoe size. When you are ready to choose a pair from the Z/2 Unaweep, there are nine color and pattern combos to choose from. 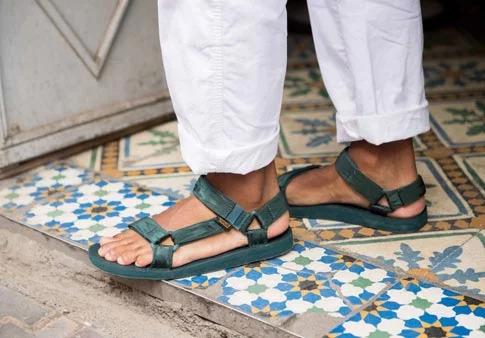 Guys, do you prefer the looking and feel of a stylish leather walking sandal? If so, check out the Cheja Athletic from ECCO, featuring a camel leather upper and rugged sole. While the sole definitely reduces shock from pounding the trail, extra shock absorption and heel support are an added bonus for many hiking enthusiasts. Keep in mind that these shoes are sold with European sizing, so make sure to double check your country’s size with EU sizing before you buy them. We hope this article helped you to find the best hiking sandals for your next big adventure. Make sure to narrow down what your specific needs are before you make your big purchase. Check out these other travel products that also make wonderful gifts for travelers. Should you have any questions or comments for us, please feel free to leave a message below. We will be sure to get back with you soon.